With a market that churns outs close to NT$5.2 billion each year, chocolate is a pretty big thing in Taiwan. 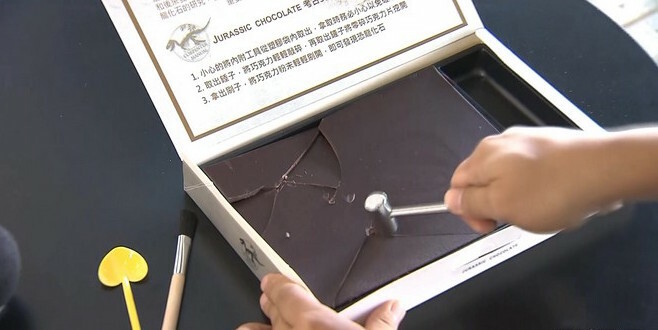 A recent entry into the market is the Fossil Jurassic Chocolate package, which allows chocolate enthusiasts to play the role of an archaeologist, literally digging into the sweet, sugary goodness that awaits. Upon opening the box, you’ll be greeted with a solid slab of bitter chocolate. But hold your dinosaurs; don’t bite into the chocolate just yet. First put on your archaeologist hat and crack the bitter chocolate surface with a small hammer. Then brush and sweep away the sweet, fine chocolate dust to reveal the fossil of a terrifying (but delicious) tyrannosaurus rex beneath, made from white chocolate. And in case you were wondering, everything in the box is edible. Made by dessert company Carpenter Manual, Fossil Jurassic Chocolate is available at Carpenter Manual shops at select department stores in Taipei including on B2 of Sogo Fuxing, B1 of Sogo Tianmu and B2 of Shinkong Mitsukoshi Xinyi Place A4 building. Each branch will sell only five boxes of Fossil Jurassic Chocolate each day starting at 3pm, with customers limited to purchasing one box a day.